The Grand Illinois Trail is a 535-mile loop trail in northern Illinois. It goes from Lake Michigan to the Mississippi along the northern border of Illinois and then loops back across the state along the Illinois River and the Hennepin Canal. Approximately 200 miles of the route is on paved township and county roads while the rest is on limestone trails or paths. Ride Illinois and the Illinois Department of Natural Resources partnered to produce our downloadable Grand Illinois Trail Guide to help promote the use of the beautiful long distance bicycle routes in our state. The guide divides the trail into ten segments, each with a map and “clockwise”-oriented cue sheet for directions and local features to enjoy. You’ll find nearby accommodations including lodging, camping, food, and bike repair. Detailed maps guide you through areas with many turns. If you’re interested in touring parts of the Grand Illinois Trail with a group, consider joining us for our annual Grand Illinois Bike Tour. 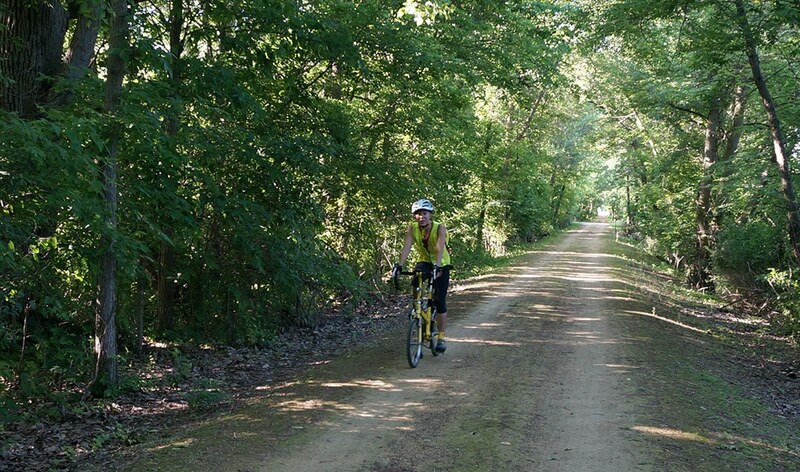 The tour is a fully supported, six-day ride featuring sections of the Grand Illinois Trail and attracting over 200 riders!